Kerala is in the midst of the worst-ever drought in 115 years. Bharathapuzha, also known as the Nila, is the lifeline of Coimbatore district in Tamil Nadu and Palakkad, Thrissur and Malappuram districts in Kerala. TA Ameerudheen | A bore well in the river bed of Bharathapuzha. The thin crop of green on the river bed of the Bharathapuzha made for an unlikely sight in March. 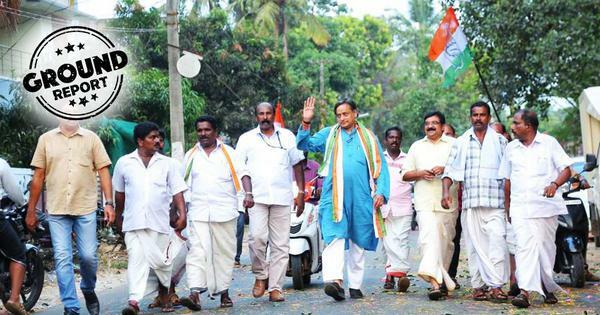 It had been four months since Kerala’s second longest river had gone dry. Originating in the Anamalai hills in Tamil Nadu in the Western Ghats, Bharathapuzha flows 209 km through Kerala before joining the Arabian Sea. The failed monsoon in 2016 had turned long stretches of the river into a bed of sand in December, months before the onset of summer. In the last week of March, however, a dense aromatic grass sprouted on small patches of the river bed in Kuttipuram in Malappuram district. It was vetiver grass, also known as khus in some parts of India. A major ingredient in Ayurvedic medicines, perfumes, soaps and shampoos, there is a large commercial market for it. Normally grown on the banks of the river, this year, farmers planted vetiver on the river bed itself, sinking borewells right there to find water to irrigate the crop. But environmental activists believe that borewells on the river bed will lead to Bharathapuzha’s destruction. It will lower the water level, damage the aquifers, cause the collapse of the groundwater system, and lead to salt water intrusion into the river. 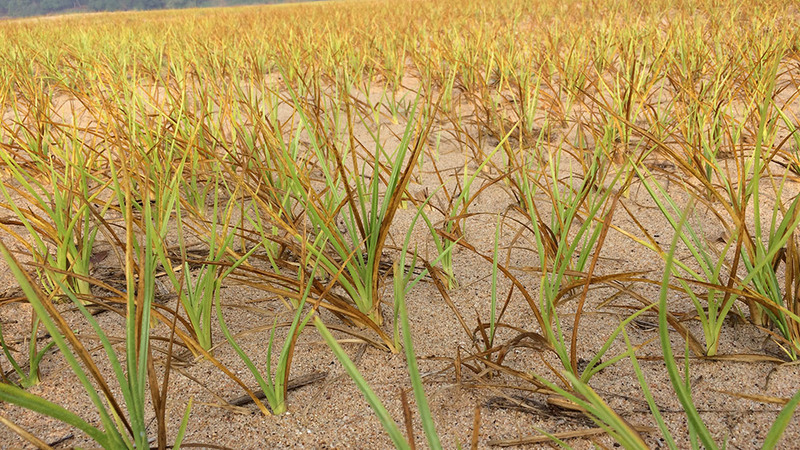 Illegal vetiver cultivation on the bed of the Bharathapuzha river. Photo credit: TA Ameerudheen. Kerala is reeling under the worst-ever drought in 115 years. It began with a deficient southwest monsoon during the four months from June 1 to September 30. 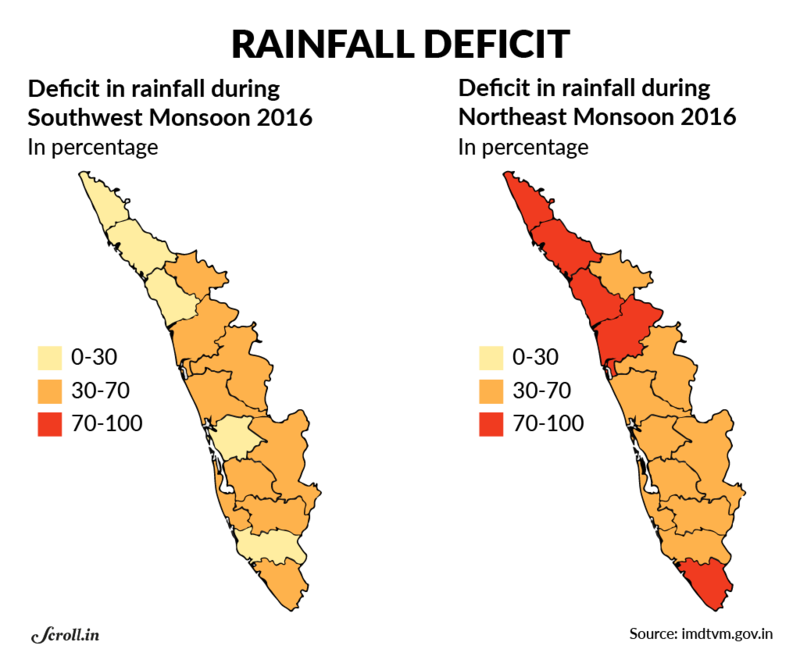 All the 14 districts received below average rain – the deficit ranged from 24% in Ernakulam district to 59% in Wayanad district. The northeast monsoon between October 1 and December 1 in 2016 also failed to bring cheer as the state recorded a rainfall deficit of 67%. Altogether, the state got 185 mm of rainfall, which is about 33% of the normal rainfall of 480.7 mm. 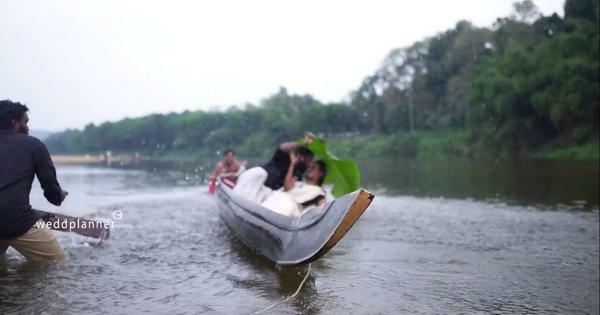 In March, there was some relief when summer rain lashed almost all parts of the state, except the northern district of Kasargod. Against the average of 18.1 mm of summer rain, the state received 83.5 mm this year, a massive increase of 362%. “The increase in summer rainfall was due to the temperature contrast between sea and land,” said S Sudevan, director of the Indian Meteorological Department. 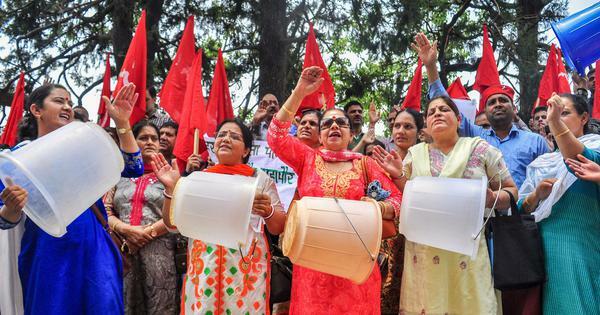 While the rain brought some cheer to farmers, it was not enough to offset the failed monsoon seasons of 2016, or recharge well, lakes and rivers, he said. The double whammy in 2016 continues to baffle scientists. Sudevan said that it was very rare to observe deficient rainfall in both monsoon seasons. “A major reason for this phenomenon might be the development of cyclonic storms like Vardha which hit Chennai,” he said. Given Kerala’s downward-sloping topography, all the rainwater drained into the sea within 48 hours of the downpour. 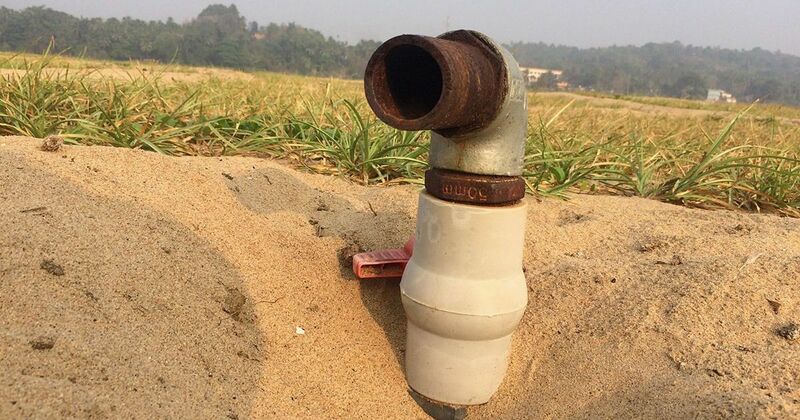 “We do not have sufficient mechanism to conserve water,” said Dr PS Harikumar, senior principal scientist at the Centre for Water Resources Development and Management, a state-government funded research organisation in Kozhikode. Over the years, the state has seen extensive deforestation to create space for more paddy cultivation. This has reduced the land’s capacity to stem the overflow of rainwater, Harikumar added. 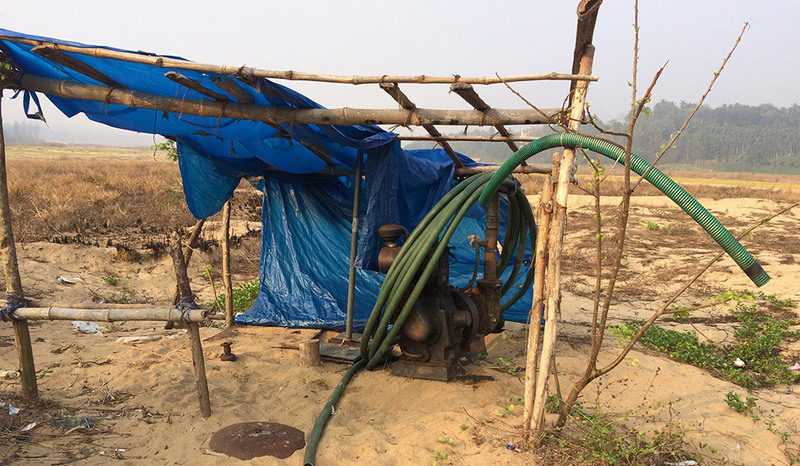 A diesel-powered water pump to operate borewells in Bharathapuzha. Photo credit: TA Ameerudheen. According to the State Revenue Department, the drought has destroyed 30,353 hectares of agricultural land, including 26,400 hectares of paddy crops. 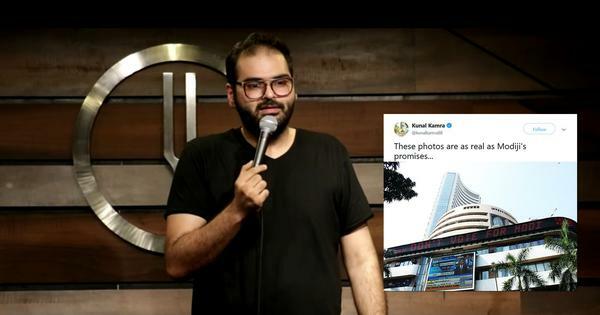 The total loss was estimated to be around Rs 225 crores. 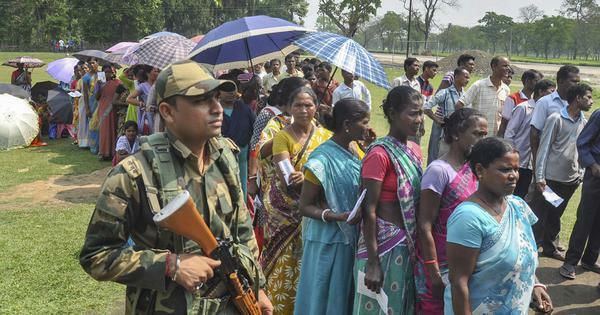 The state government had issued a moratorium on agricultural loans taken by farmers, sought central government assistance for drought relief, and set up water kiosks to ensure uninterrupted drinking water supply. In order to protect labourers from sunstroke, the labour department has rescheduled day-time working hours and has asked employers to give workers a mandatory break between 12 noon and 3 pm, till April 30. The drought has affected the state’s longest river, the Periyar, too. A report in The Hindu suggests that the river could soon go dry, affecting drinking water supply, power generation and irrigation. The low level of water on that river has already forced the tourism department to halt boat services on Thekkady lake. Bharathapuzha, also known as Nila, is the lifeline of Coimbatore district in Tamil Nadu and Palakkad, Thrissur and Malappuram districts in Kerala. Environmentalists have been raising concerns over the slow death of the river for quite some time. The sinking of borewells on the river bed is likely to exacerbate the problem, say environmentalists. The state government has begun a crackdown on such borewells. A revenue official said on condition of anonymity that encroachments on the river bed are illegal since it is the property of the state government. The official said that his department was closely monitoring the construction of open wells and borewells by private parties. 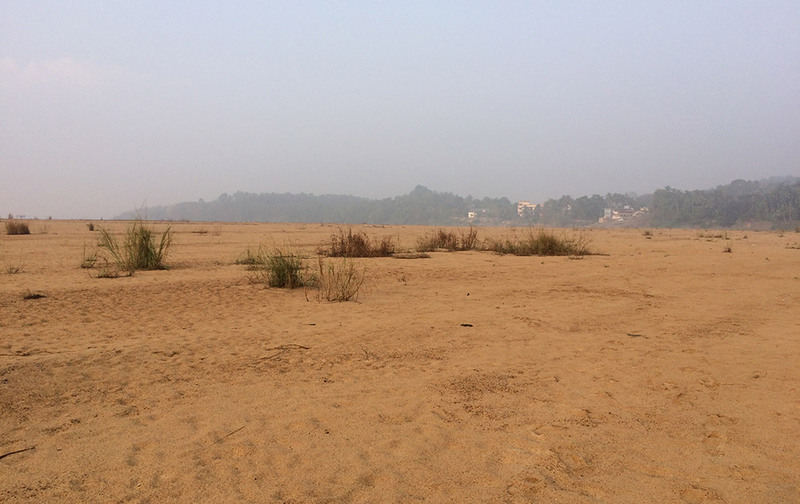 The dry river bed of the Bharathapuzha. Photo credit: TA Ameerudheen.